One thing is guaranteed in this main event: it's going to be a crazy back-and-forth with someone going unconscious. Despite a three-fight skid, Cowboy (-160) is the slight favourite thanks to a deep UFC resume that includes 13 post-fight bonuses including 24 total finishes. But Medeiros (+130) is dangerous as a dog as you can get as the Hawaiian is hitting his stride on this three-fight winning streak. With 11 fights in the last three years, the damage is finally taking its toll on Cowboy who was finished by strikes in two of his last three losses. He'll have to fight smarter against the tireless Medeiros who not only has punching power but is constantly improving and is extremely durable himself. 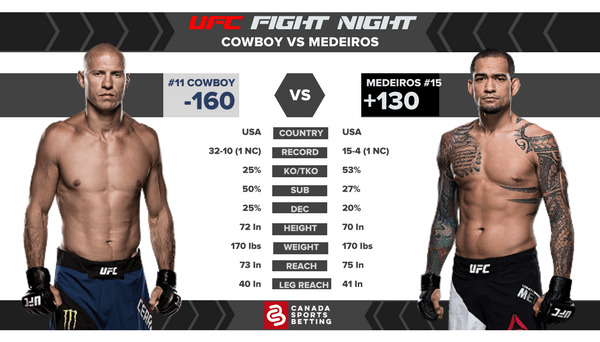 With Cowboy on the mend and Medeiros on the upswing, this fight is tough to call although recent fights suggest Medeiros may just pull off the upset. The one stat that jumps out of the page: 9.27 significant strikes absorbed per minute. That is the combined strikes both Cowboy (4.08) and Medeiros (5.19) absorb. Cowboy (4.22) and Medeiros (4.35) also combine for 8.57 significant strikes landed per minute making them prolific offensive fighters with deficient defence. This is a recipe for a fun but otherwise unpredictable fight. The difference here will be whose chin will hold up better. That leans towards Medeiros who has only been finished by strikes once and this was during a botched weight cut. At 170, Medeiros has been an absolute tank and took everything Alex Oliveira threw at him. Cerrone used to be the same fighter but at 34 with 36 fights under WEC/UFC, he's just not as durable anymore. Cerrone will have to improve his defence and nonexistent head movement against Medeiros though at his age it's unclear if he's really improving as a fighter. Alternatively, he can exploit Medeiros's lower extremities with his deadly leg kicks to open him up to a potential fight-ending head kick. This fight could play out almost like the Medeiros and Oliveira fight with both fighters trading big shots back-and-forth. They both have underrated wrestling but the fight will primarily stay standing. While it's plausible that Cowboy out lasts Medeiros, he'll have to weather a furious storm to do it. Prediction: It's too early to call Cowboy a shot fighter but he's at that point in his career where he can't afford to be as careless. Medeiros is also in the danger of being finished especially with his short turnaround. But as the younger and more durable fighter, Medeiros should eventually break Cerrone and win the fight. Lock it Up! For James Vick (-240) who will soundly defeat a game Francisco Trinaldo (+180). Vick has been an underrated fighter and is 8-1 in the UFC with his only loss to top-10 fighter Beneil Dariush. Trinaldo is a solid kickboxer and is tough but Vick has a significant size and reach advantage and will use that in his favour. Who's A Good Dog? Canadian bantamweight Sarah Moras (+135) has a path to victory against Lucie Pudilova (-175) if she gets her within grappling range. Nicknamed "Cheesecake", Moras is heftier and stronger than she looks and can neutralize Pudilova and maybe even submit her. Just Say No: to Brandon Davis (-185) versus Steven Peterson (+145). These two are well-versed MMA fighters with a penchant for getting into wild and unpredictable battles. While Davis should win, Peterson's grit shouldn't be discounted and he can win by aggression alone. Another week and another UFC event and MMA-hungry Canadian fans head to these sportsbooks to get all their betting needs. Read our reviews before making any commitments.